When Butch was a boy, his father EJ came home long enough to gulp dinner, then headed for business classes at Saint Louis University. He burned with ambition. When he saw his son sprawled on the couch reading books and munching sweet rolls, he decided that Butch was showing signs of laziness and enrolled him at Western Military Academy in Alton. Edward O’Hare crossed the river from St. Louis to Alton after 6th grade. During his six years at Western he developed into a young man whose WW II exploits would make him a household name. 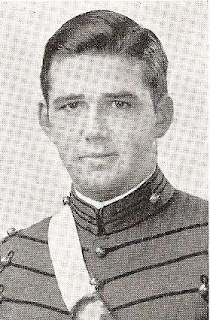 O’Hare attended the US Naval Academy following high school, graduating in 1937. His assignment as a carrier pilot put him among the vanguard of WW II forc­es. In 1942, flying from the carrier Lexington, he found himself in the air alone as a squadron of 9 Japanese planes approached. Ignoring all thoughts of his own safety, O’Hare shot down at least 5 of the enemy planes totally disrupting the attack and sav­ing the carrier. For his cour­age and skill he was awarded the Medal of Honor by Presi­dent F. D. Roosevelt. He went on to win the Navy Cross and two Distinguished Flying Cross medals before his death in combat later in the war. In 1949 Chicago’s O’Hare Inter­national Airport was named in his honor. That airport would be the busiest airport in the world for over 30 years.